Figure 1. 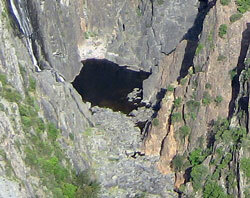 The rocks forming the gorge, orientated almost vertically, are cut across almost horizontally by the plateau. The Bible tells us that the waters of Noah’s Flood rose and covered the entire globe, destroying every air-breathing land-dwelling animal on earth (Genesis 7:17–24). After that they began to recede (Genesis 8:1–3). The process of receding water is mentioned repeatedly: ‘the waters receded’ (Genesis 8:1); ‘the water receded steadily from the earth’ (8:3); ‘the waters continued to recede until the tenth month and on the first day of the tenth month the tops of the mountains became visible’. It took 2 ½ months from the time the Ark came to rest on the mountains of Ararat until the other mountains became visible. Clearly a lot of water was flowing off the land. … the waters were receding for more than seven months before the earth was dry and Noah could open the door of the Ark. The length of time taken for the waters to recede is further indicated by Genesis 8:8 which says Noah released a dove to ‘see if the water had receded from the surface of the ground’. However, the dove returned because it ‘could find no place to set its feet because there was water over all the surface of the earth’ (v. 9). In other words, the water still covered the earth when the dove was released nearly seven weeks after the mountains became visible, which was 2 ½ months after the Ark came to rest. Altogether the waters were receding for more than seven months before the earth was dry and Noah could open the door of the Ark. As the waters receded from the continents they would have eroded the land leaving shapes that form the landscapes we see today. Thus, landscapes should provide powerful evidence for the effects of Noah’s Flood as well as a way of relating geological formations to the timing of the events of the Flood—provided you know what to look for. Figure 2. Wollomombi Falls (left) and Chandler Falls (right), New South Wales, Australia, after heavy rain. Even though the flow of water is great and the falls spectacular, the flow is relatively small when compared with the gorge itself. As the sea floor started sinking relative to the continents, the floodwaters covering the continents began to flow into the oceans. On each continent the water flowed away from the higher areas in the middle toward the lower areas at the edges, in a direction generally perpendicular to the shore. Since the Flood was global the receding waters would have produced the same sort of signature all over the world. At first, the water flowed in sheets. This means that they eroded surfaces relatively flat, even in areas of high elevation on the continents. The water would tend to cut across geological strata like a knife cutting cheese. Such high plateaus are a common feature of today’s landscapes and have been given a name—peneplanes, which means ‘almost a plane’. Figure 3. 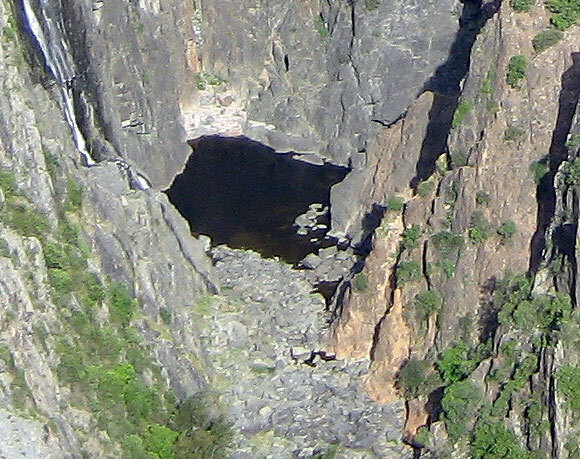 The plunge pool for the Wolomombi Falls is surrounded by only a small amount of broken rocks, or talus, suggesting little rock has fallen into the gorge since it was first eroded. Eventually, the flow of floodwater reduced with time. Thus, the water sheets would divide into mega-rivers, many times wider than the widest rivers that flow over the contents today. These mega-rivers would dissect the plateaus into wide valleys. They would also cut across the underlying geological structure in their journey to the ocean, acting as if the structure did not exist. This is a common feature of present day landscapes and geologists have coined a term for it—discordant drainage. And the mega-rivers would carry even the largest rock debris clear out of their valleys. After the Flood and up to the present time, rainfall draining from the land would flow in the same valleys that were cut by the Flood. 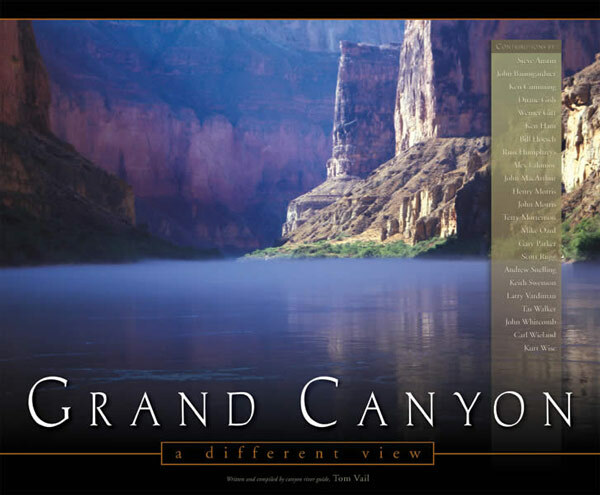 However, because the water flowing from the continent is much less than the mega-rivers draining the Flood, today’s rivers and streams are much smaller than the valleys they occupy. These rivers have also even been given a name—underfit rivers. In the 4,300 years since the Flood, ice, wind and water have continued to erode the landscape. In the first few centuries, ice sheets developed on some areas of the continents, especially in the northern hemisphere, and these produced tell-tale effects on the landscape. However, in areas that were not glaciated, the channels cut by rivers since the Flood are relatively small, about the same size as the river itself. And those rivers would not have enough energy to carry the largest rock debris, called talus, away. In order to be transported, large rock debris would need first to be broken into smaller pieces. Look for plateaus that have been cut relatively flat, even across the underlying geological structure, such as through mountain ranges rather than around them. Look for wide valleys that cut into the plateaus. Look for rivers that are much smaller than the valleys they occupy and that also cut across the underlying geologic structure. 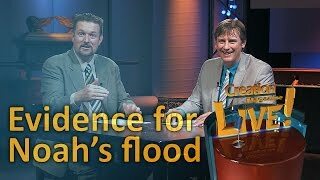 We can use this simple model to see the effects of the receding waters of Noah’s Flood all over the world. Look for plateaus that have been cut relatively flat, even across the underlying geological structure, such as through mountain ranges rather than around them. Look for wide valleys that cut into the plateaus. Look for rivers that are much smaller than the valleys they occupy and that also cut across the underlying geologic structure. Check the amount of talus in the gorges and valleys. Armidale, New South Wales sits atop the high plateau that forms part of the Great Dividing Range, a range that runs from the north to the south of the continent adjacent to the east coast. 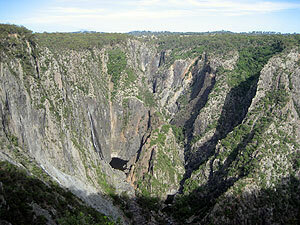 Not far away, at the edge of the plateau, the Wollomombi Gorge cuts deep into surface (figure 1). After heavy rain two waterfalls flow into the gorge (figure 2). 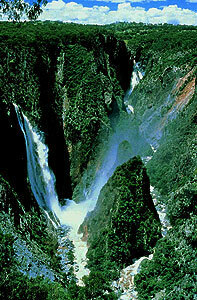 The Wollomombi Falls to the left has an impressive drop and the Chandler Falls to the right churns down the steep escarpment in a narrow channel. The rocks in the gorge are tightly folded and faulted and have a near vertical orientation.1They form part of the eastern block of Australia known as the New England Fold Belt, which was folded, deformed and uplifted. Figure 4. Escarpments of the narrow downstream gorge support only a limited growth of vegetation. Little rock debris has fallen into the gorge since it was carved as indicated by the absence of talus in the bottom. Notice that the plateau cuts the vertical strata almost horizontally forming an undulating land surface nearly 1,000 m above sea level. It’s easy to imagine how this plateau could have been cut by the receding floodwaters that were running in sheets eastward off the continents. 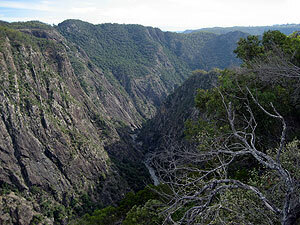 The Wollomombi Gorge is quite narrow at the bottom but nearly a kilometre wide in places at the top. It is much narrower than the wide valleys further east that are used for farming and which can be many tens of kilometers across. This narrowness indicates that the gorge was cut quite late geologically. Is it possible for the gorge to have been cut by the Wollomombi and Chandler rivers in the approximately 4,500 years since the Flood? That seems unlikely to me considering the volume of material removed from the gorge. It seems more likely that the gorge was cut very late in the Flood when the flow of water was much reduced but still flowing with significantly more energy than the present rivers can muster, even after heavy rainfall. Figure 5. 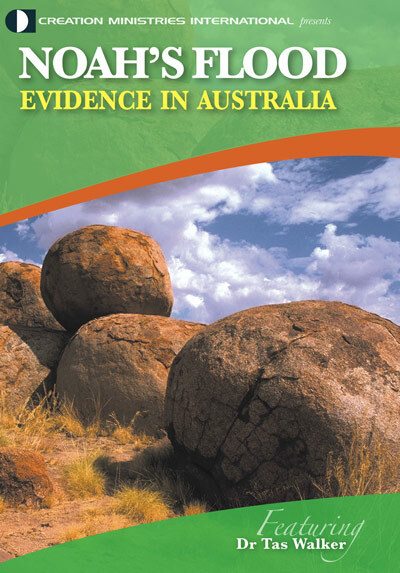 Interpreted geological history of the Wollomombi Falls. Rocks of the area were deposited early in the Flood, compressed and uplifted. The flat plateau was eroded by sheet flow, during the Abative phase of the Flood. The narrow gorge was eroded very late in the Flood, during the Dispersive phase. The trees and other vegetation, growing sparsely on the escarpment, indicate that the escarpment is relatively stable otherwise the vegetation would not be able to become established. There is very little talus in the bottom of the gorge. The plunge pool for the Wolomombi Falls is about the correct size for water flows that occur at the present time, suggesting that this small pool was excavated after the Flood. Although there are some blocks of rock around the plunge pool the volume of talus is small. This suggests that the talus has accumulated after the Flood and generally not been carried away. In other words, the gorge was mostly excavated when the water flows were much greater and had enough energy to carry the material out. These conclusions depend on whether the rock falling from the walls of the gorge tends to break away as large or small blocks, and how readily the rock material will break down. The Wollomombi Gorge at the edge of the large plateau near Armidale, Australia, is a good example of the sort of geologic signatures that the receding waters of Noah’s Flood carved onto the earth. Sheet flow during the Abative phase of the Flood cut the horizontal plateau across the vertical structure of the underlying rocks, and channel flow in the Dispersive phase late in the Flood cut the gorge itself. Only minimal erosion has occurred in the 4,300 years since the Flood. Do rivers erode through mountains? The rocks consist of greywacke (a hard, poorly sorted sandstone), mudstone, and slate (a metamorphic rock). Return to text.